My latest for The Memphis Flyer, on the roots of protest. [I]t is a short walk from national protests against police brutality to calls for economic justice. Rookie activist Tami Sawyer wants to help people in Memphis — the poorest large metro area in the nation — make that journey. In the past two weeks, the 32-year-old St. Mary’s alumna organized two die-ins — one outside the National Civil Rights Museum and another on Beale Street. These and dozens of similar protests nationwide were sparked by deaths of two unarmed black men — Michael Brown in Ferguson, Missouri, and Eric Garner in Staten Island. In both cases, a grand jury failed to indict the white officers who killed them. But the fury on display at protests and on social media is not directed solely at a warped criminal justice system. It is the entire game that is rigged. 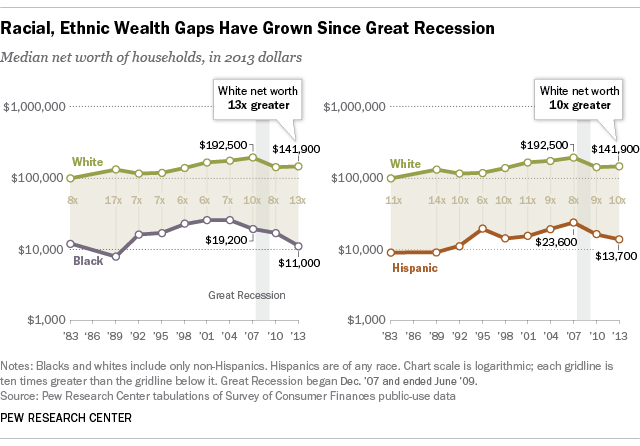 If you want to be thoroughly disgusted by the lack of economic power, check out the Pew Research Center’s latest report on the black-white wealth gap. It’s staggering. This entry was posted in Being black, inequality, Justice, Poverty, Public Policy and tagged #blacklivesmatter, Eric Garner, Ferguson, inequality, Memphis, Michael Brown, protest. Bookmark the permalink.